The main task for the drone is propagating the queen. The drones are mainly available during the summer. The drone is obviously larger than her working sisters. The drone is somewhat larger, but does not have a stinger. As a beginning beekeeper you can recognize the drone on his big facet eyes. See above photo the eyes are very large and almost touch each other. Drone brood is started after the summer bees have taken the place of the winterbees. The time when this happens, depends on the time of the year. The production of drones cost a lot of energy for the hive. So a big hive can start earlier in the season as compared with a small hive. The swarm drift of the hive also is important. normally a drone needs around 37 days to ripen its sperm. So well before this time the hive begins with nursing drones. It all starts with the egg, which is laid by the queen. in the previous post it was decribed that the queen can choose if the egg is fertilized or not. Drones need bigger comb cells to hatch. In the spring or when the bees need a new queen. The worker bees will build drone comb, which is normally build lower on the comb structure. A unfertilized egg is laid in this bigger space. Below are the steps listed to become from egg to drone. Day 1 – 3: After three days a larvae will hatch from the egg. The larvae starts to feed itself with the food received by the workerbees. Day 3 – 9: The feeding will continue for six days after the larvae will pupate into a drone pop. After which the workerbees will cap the comb chamber with a small layer of wax. Day 9 – 24 (25*): After the pupating is finished the bee pop will remain popped for twelve days. Emergence day 24 (25): When the twelve days are over. The bee will appear out of its pop and chews the wax cap away. A short time after his birth it goes straight to work. * Drone cells are often located at the edge of the brood nest. This means drones are more sensitive to fluctuating temperatures. When it gets colder the bees will shrink their surface. The drones benumb and it will take longer to develop. The food requirement is bigger than of the worker bees. Drones are about 2.5 times bigger than worker bees (236 mg vs 99 mg). The larvae are also bigger, so they need more food. larvae will get fed by workerbees on average 1150 times a day, during a period of 6 days. After hatching from the cells the drones will get fed for 4 days by the workerbees. In comparison the workerbees can feed them selves after they hatch from their cells. The amount of feeding per time is higher when the drone is a few hours old. During the 4 days the feeding is lessend. The pollen amount for raising a drone larvae is 5 times higher than which is required to raise a workerbee. The drone larvae can send out a pheromone to notify the worker bees about the food needed. 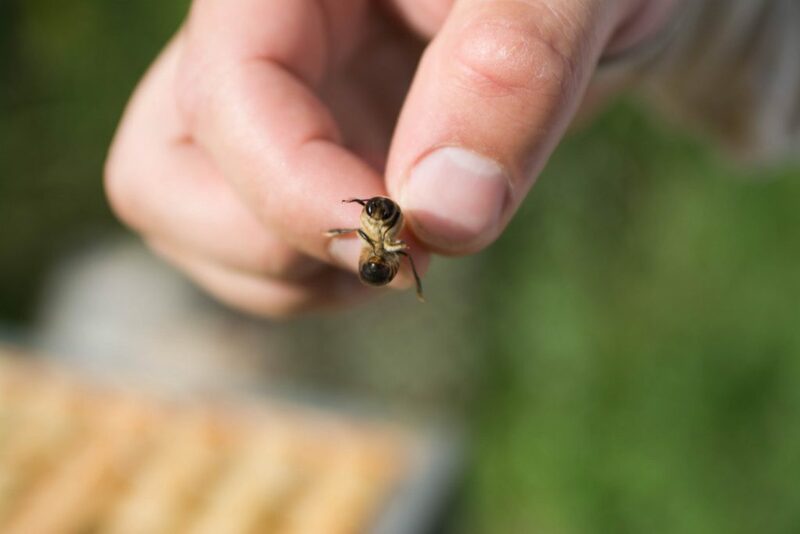 the food requirements for a drone is different from a worker bee or bee queen.This drone pheromone also attracts the varroa mite to the drone cell. Sometimes the worker bees neglect the drone brood. During the year there can be a good honeyflow in nature. There is a lot of nectar to collect in a short time frame. All available bees will fly outside to collect honey. Even younger bees are required to collect the nectar. when this happens it can occur the drone larvae aren’t fed enough. If the brood is not good enough the drone larvae are removed from their cells thrown out of the hive. The task of the drone is to propagate the queen. Therefore it has to orientate itself around the area. When the drone is 6 till 8 days old it will start orientating outside of the hive. This is usually done late in the afternoon. The duration of the flight normally is around 5 till 15 minutes. When the Drone is older than 12 days the orientation flight will change into propagating flights. The drone looks for a potential virgin queen to propagate with. Drones can migrate from one colony to the next to avoid inbred. As earlier mentioned beekeepers normally don’t like too much drones in their hives. It is important to know, drones in a beehive are very natural. I know a lot of beekeepers who kill their drones and expect the neighbor beekeeper will breed drones to propagate his queen. Please be aware to leave some drones in your hives. You can not expect neighboring beekeepers to deliver your drones. Around five percent of drones in a hive are migrating to different hives. Although I’m also guilty of cutting out brood frames, I normally leave about 2 broodframes with drones available in the hive. Drones from different hives gather at special drone congregation areas. On these places the virgin queen is propagated. There is a lot of mystery around these places. Normally they are located far from the hives. It is located around 15 meters till 30 meters from the ground and can have a wide span of tens till a few hundred meters. In austria around early 20th century there was first research done about drone congregation areas. Scientists did this by putting a virgin queen into a little cage, attach it to a balloon and check the area for drone density. The density difference was significant different outside the drone congregation areas. Just a few drones were available outside of the drone areas. Later in america they used radar to locate drone areas. They could not only see the areas but also the flying routes to getting there. The difference between an drone congregation areas and the flying route was the height they were flying at. Outside of the flying routes and drone areas almost no drones were found. Drone congregation areas can be used up to a few years in a row. It is still a mystery about how the drones find the drone congregation areas. Because drones are normally slaughtered after the end of the spring. Each drone must find the spot on their own every spring. The drone congregation areas is known to be a windless spot. Also the drone congregation areas can be found in a straight line from the hive. Often the drones can use thermal soaring to save energy. Bees are known to have magnetite particles in their abdomen. The worker bees use this partly to navigate their route. Drones develope this magnetite particles after 6 days. So scientists think drone congregation areas are areas with specific electromagnetic energy. After the food supply of bees shortens at the end of the summer. The hive will slowly reduce in size. No new drones will be born and the drones which are available are slowly moved out by the workerbees. In the netherlands this start at the end of the summer (end july/ begin august). But the start can be limited to several factors, which can be short supply of honeyflow or pollen. when there is a food shortage it starts with reduced feeding of the larvae this is mostly after aprox 2 days. If this continues the queen stops laying drone eggs after 7 days. If there is a shortage of food which is mostly noted by the whole hive after 2 days. The worker bees starts to push out the full grown drones. In the hive some worker bees are specialized in this task. The start behaving aggresively to the drones. The drones are first pushed to the sides, after which it get put out of the hive. Normally 10 till 15 drones are thrown out per day. This process can continue till several weeks.